The peaceful transition of power from George W. Bush to Barack H. Obama has been an amazing historical event to watch. 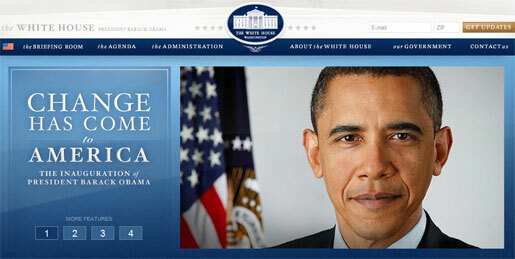 At 12:01pm President Obama had already made Change happen on the internet with the new WhiteHouse.gov website. It is a beautiful, informative, and very Web 2.0. It uses jQuery and is fully XHTML 1.0 transitional compliant. It carries a similar look, feel, and tone as his Change.gov website and personal website BarackObama.com. Underneath the covers a significant transition of power has occurred: Obama has moved from PHP to ASP.net. A quick look at the HTML source from each of the websites shows plainly that BarackObama.com and Change.gov are powered by the open-source LAMP stack, and WhiteHouse.gov is powered by Microsoft’s closed-source ASP.net stack. This change seems to go against the theme of transparency and progress which has taken Obama to the highest office in America. Here’s to hoping this is a make-shift solution that satisfied pre-existing bureaucratic requirements. Does anyone in the blogosphere know what prompted this move? Interesting switch - I would love to see the web designers and developers post about their process on the Whitehouse.gov site. I'm sure 99% of the world could care less, though. Well since this article has been posted it appears whitehouse.gov has transitioned over to Drupal (PHP).